NGO Recruitment is Australia’s not-for-profit sector recruitment specialist. For almost 15 years, we have recruited for a vast range of not-for-profits, from large multinational NGOs to neighbourhood centres, and everything in between. Our unrivalled networks and specialist firsthand sector knowledge enable us to find the very best local and international talent to help drive, shape and empower the not-for-profit sector across the region. We recruit for: International non-government organisations, Charities, Community groups, Health and animal welfare organisations, Education institutions, Industry associations, Faith-based organisations, Political and activist groups. Our focus is sector specific, role generic. 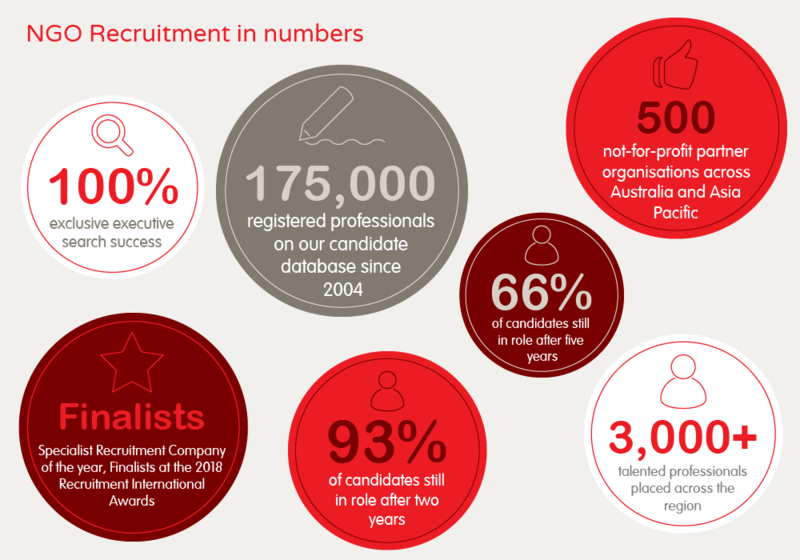 We offer exclusive executive search and permanent, contract and temporary recruitment services and recruit all head office and operational job roles within an organisation – from executives, heads of finance and fundraising directors, to lawyers, lobbyists, HR managers, disability case managers and the complete range of finance and administration professionals. We also specialise in placing board members for a variety of organisations within the sector. We offer a collaborative and values based recruitment service founded on our in-depth understanding of the unique complexities and culture of the sector. The value we place on cultural fit underpins our recruitment success. We partner with our clients who trust us each step of the way to find the right person, not just any person for the job – no matter how complex the brief. With offices in Sydney, Melbourne and Brisbane, our experienced consultants work as a national team recruiting across metropolitan, regional and remote Australia and into the Asia Pacific region. Our proven international search capabilities also enable us to find the very best global talent for specialist roles.